The London Modern Guild has invited the Toronto Modern Quilt Guild to show of their modern quilts. Rebecca Burnett and I are venturing to London to show off the work made by our talented members. 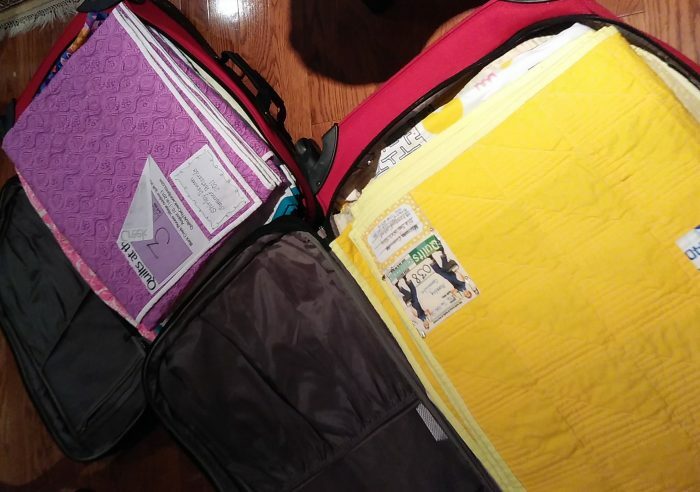 Forty quilts are packed into 2 suitcases and 4 very large bags ready for this Saturday October 13, 2018. The meeting begins at 12:30 pm. at the Boyle Memorial Community Centre, 530 Charlotte Street, London ON. 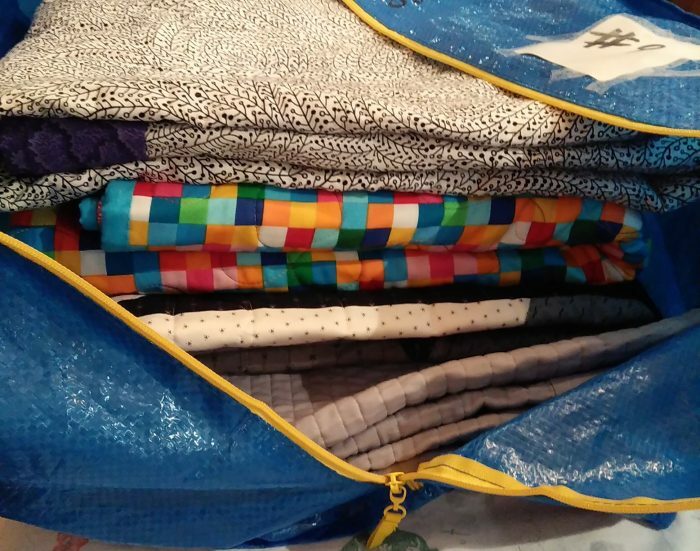 Come out to see what the Toronto Modern Quilt Guild has been working on! I love fabric in all its forms, especially linen. 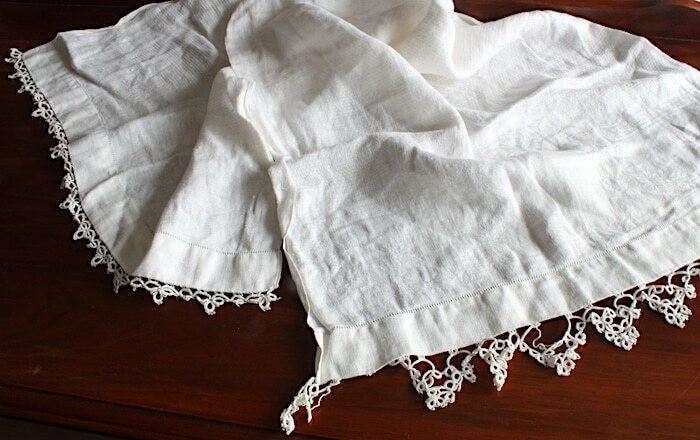 With age and use, linen becomes soft and drapes beautifully. 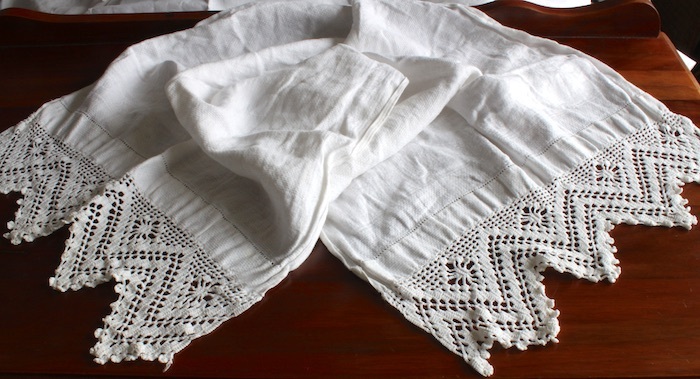 Linen is extremely durable, it is absorbent, strong, doesn’t abrade and is stronger when it is wet. Linen or flax has been used for clothing, bedding and other household uses for many thousands of years. Although linen has had a resurgence in popularity, it’s been primarily in the clothing industry. 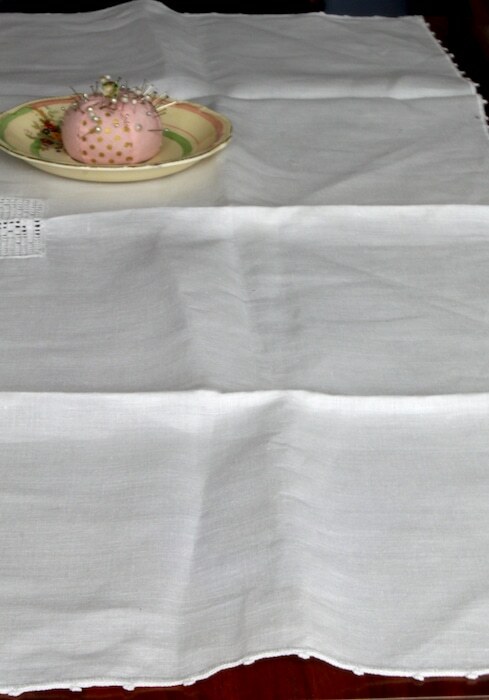 It makes me sad to see beautiful linen napkins, hand towels and tablecloths in thrift shops. Some have beautiful handwork – tatting, crochet, embroidery, cutwork. Someone has lovingly and painstakingly created these precious and useful items. So, I recently liberated a few pieces of linen from a thrift store. The bureau scarf above has a few small holes but the crocheted monogram and the detail around the entire piece is still pristine. 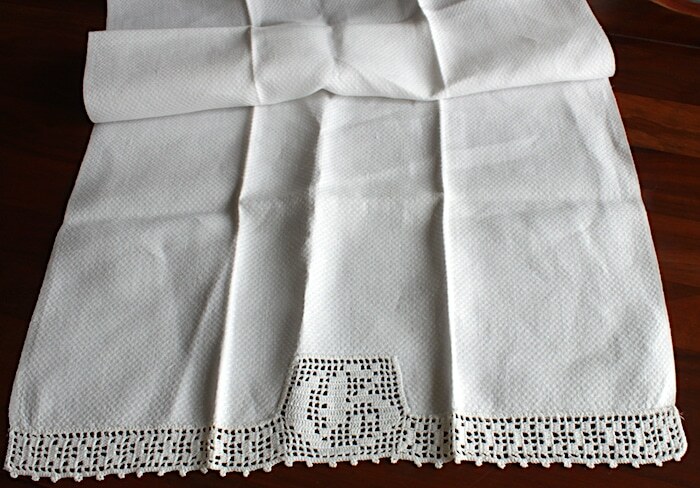 This hand towel with the beautiful deep crochet edge is in excellent condition and just needs to be pressed. 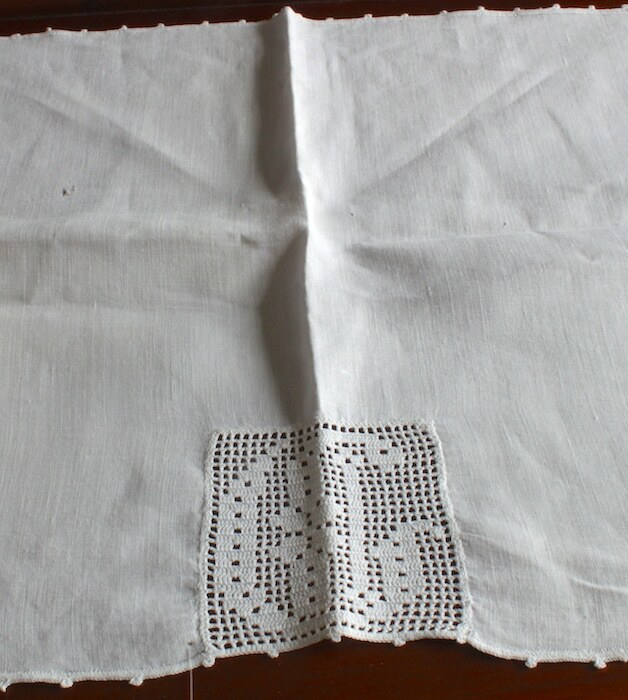 The tatting on the linen hand towel below has a little damage on one end. If it can’t be repaired, I will probably dip it in indigo this spring and then use it in an art project. I could also remove the damaged end, hem the towel. It is just to beautiful to toss! The hand embroidered flower garland is made of a coarser linen. I’ve washed it a couple of times to remove some stains, but they are stubborn. I will probably cut this one up for a project I have in mind. The puppies are also stained but too cute! This too will be cut up into a project. Liberating linens is not a new endeavour for me. 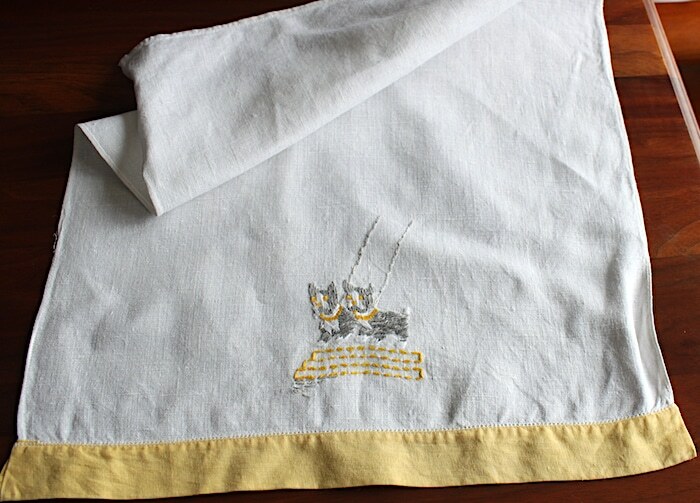 Whenever I find napkins, towels, table runners or any other linens, I can’t help but bring them home with me. But, I can’t keep them all! 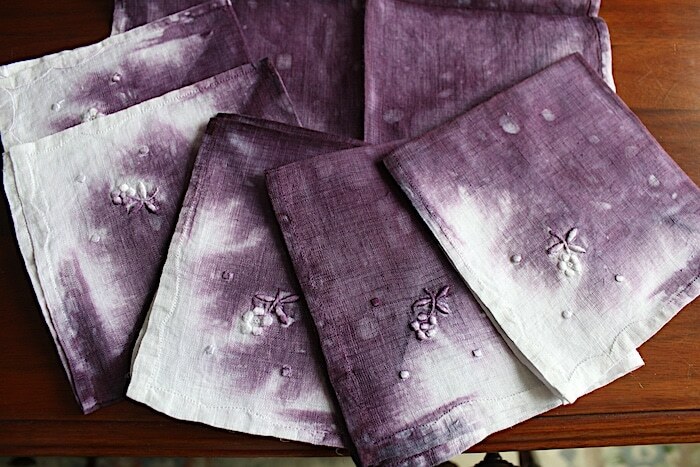 The cocktail napkins above are dyed a beautiful purple. The set of 6 would be a fun addition to your next tea party. 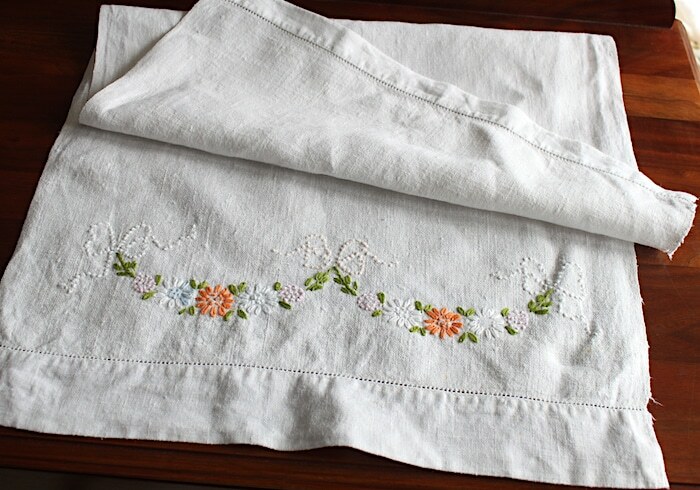 They are embroidered with a small flower on the corner and hemmed with a beautiful scalloped edge. 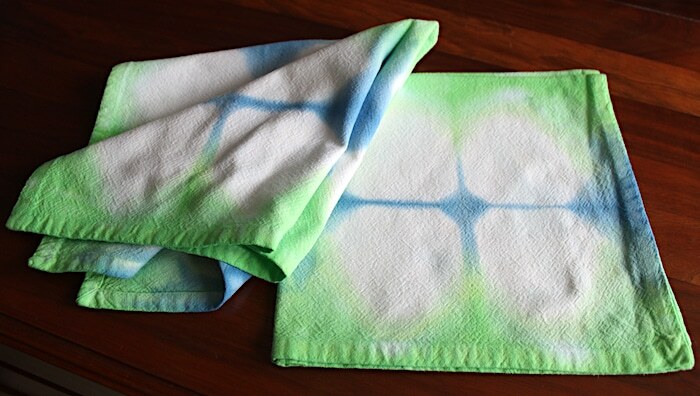 Two shibori dyed green cocktail napkins. Best with a dry martini! 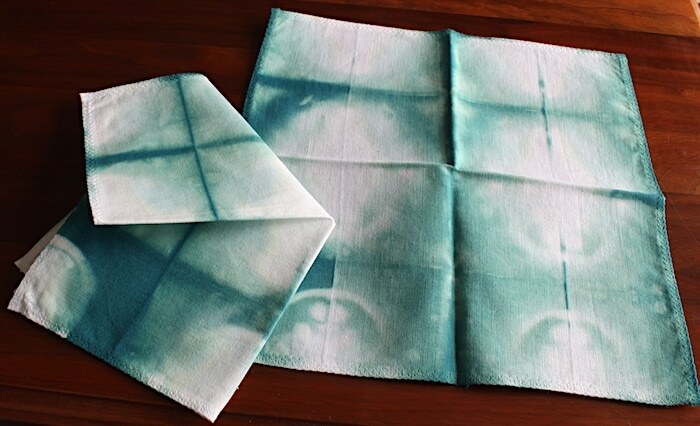 This set of 2 cotton table napkins in blue and spring green are just perfect for a fun luncheon with your best friend. 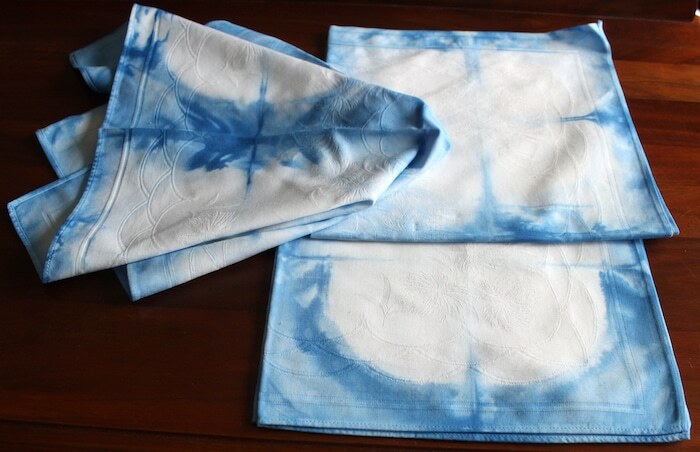 Three elegant napkins are shibori dyed in blue. Enjoy take out in style! Look for these napkins in my new online shop. If you have any ideas for my newly liberated linens, let me know. Fabric Fusion is finished after three years! I began this quilt in a class I took at QuiltCon with Weeks Ringle. 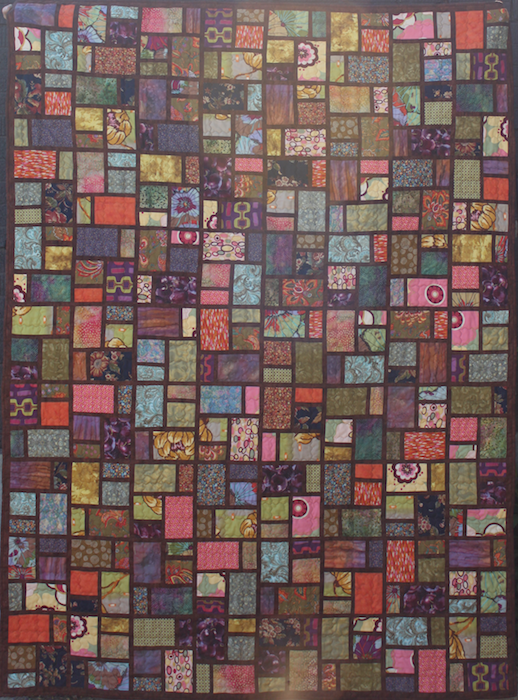 The quilt is designed by Weeks Ringle and Bill Kerr of Modern Quilt Studio. 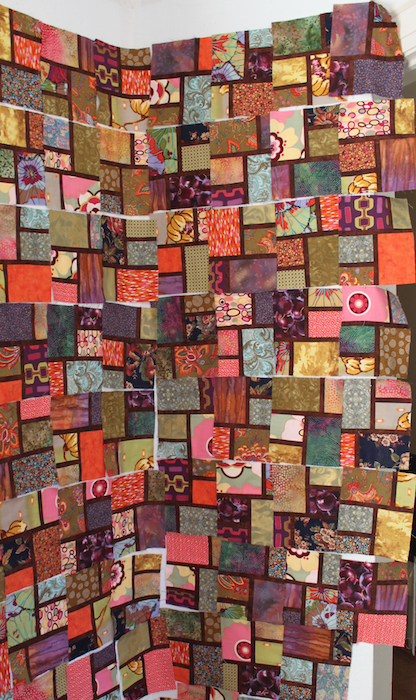 I used a large variety of fabrics in this quilt: batiks, florals, tone-on-tones, modern, Kaffe Fassett, and traditional prints. They all “go” together because of the values I chose. Weeks spent a lot of time with us, explaining what to look for in our stash. 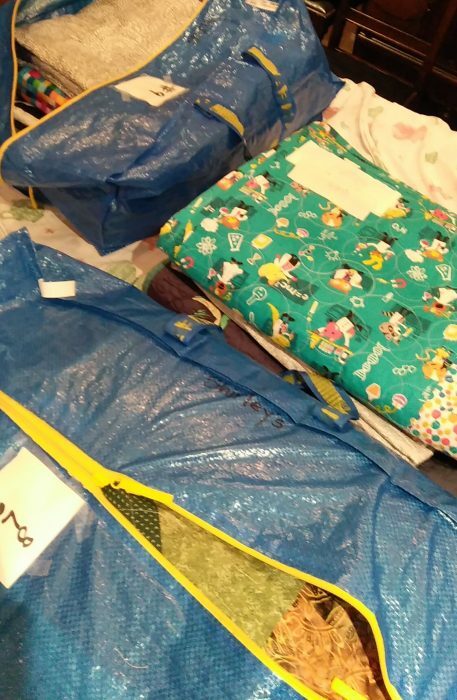 Those of us that brought fabrics were helped to weed out those fabrics that weren’t appropriate and to incorporate others (sometimes from another person in the class!) that were unexpected but a much more interesting choice. 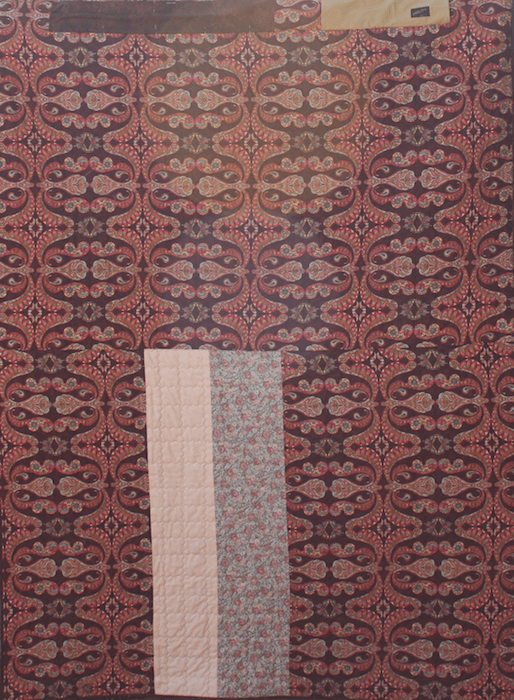 The quilt was machine quilted with a walking foot and a stretched out zig-zag. First I quilted the vertical lines and then the horizontal. I like the texture that is created. I didn’t measure the lines, I just estimated the spacing. 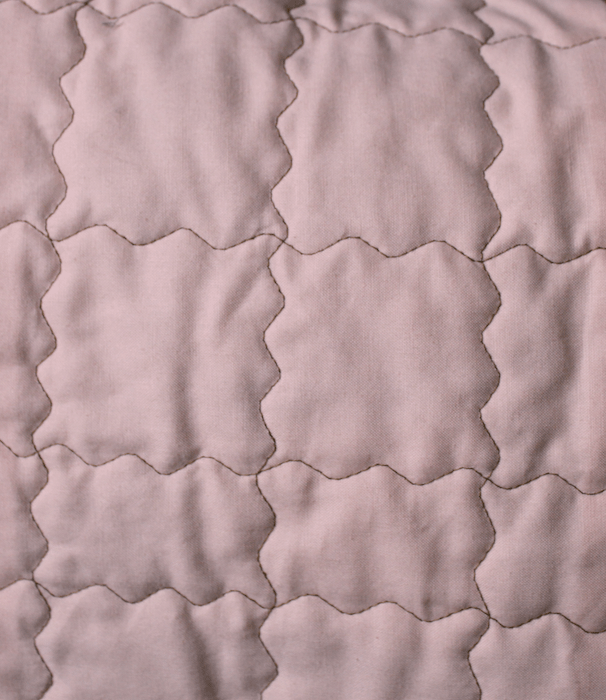 You can see in the detail of the back above that the quilting lines are not perfectly spaced. Do you mark your quilting lines? I’ve finally started laying out the blocks for the Fabric Fusion quilt designed by Weeks Ringle and Bill Kerr of Modern Quilt Studio. 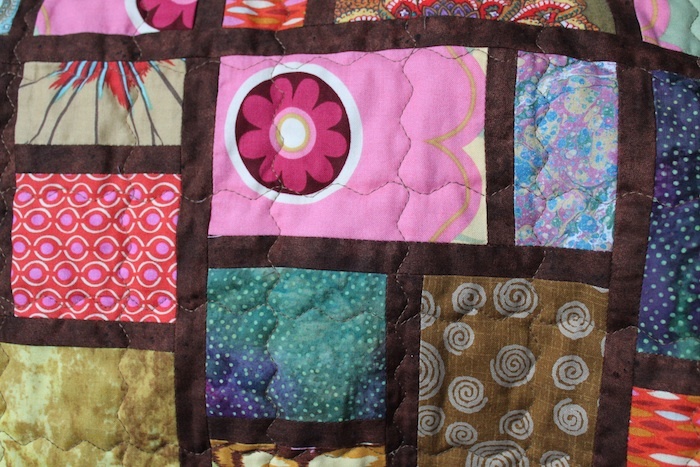 I started this quilt in a class I took with Weeks Ringle at QuiltCon in 2013. We spent quite a bit of the class learning about value, saturation and fabric selection. 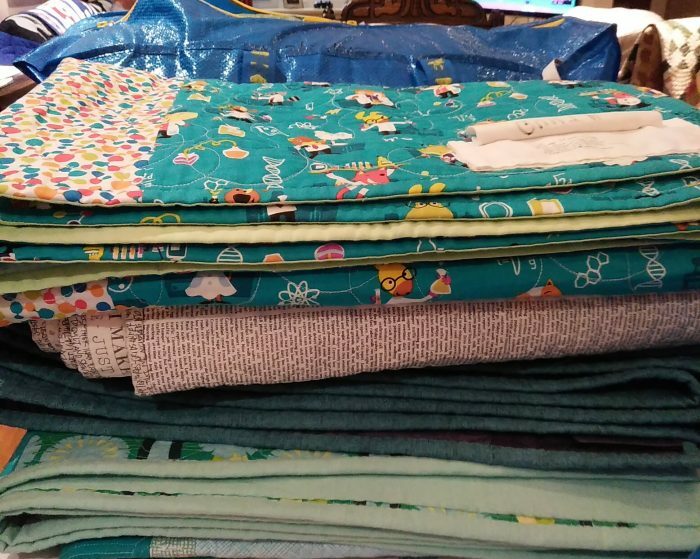 We were encouraged to bring an assortment of fabrics to the class, including fabrics we loved, hated, from different genres. Weeks spent time with each person, going through the fabrics, selecting and eliminating from the pile to come to a beautifully curated collection. I learned a lot and it opened up new ideas about fabric selection. I encourage anyone who has the opportunity to take a workshop from either Weeks or Bill to do so. They are excellent instructors with a breadth of knowledge in the field of design. They are also very lovely people, genuine and sincere. 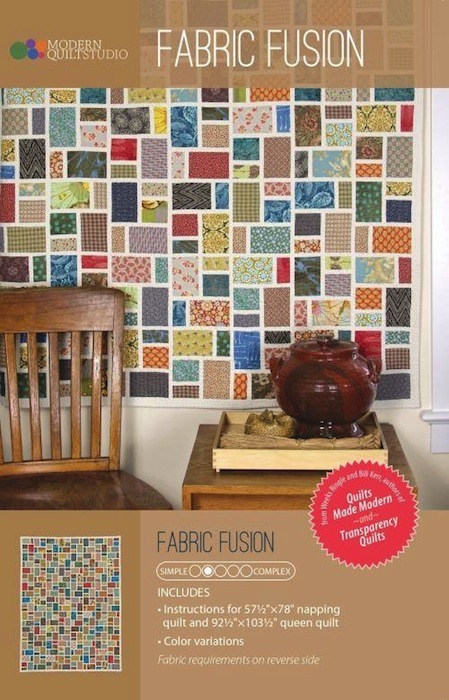 The Fabric Fusion pattern is available through their website. Have any of you completed any quilt designs from the Modern Quilt Studio?